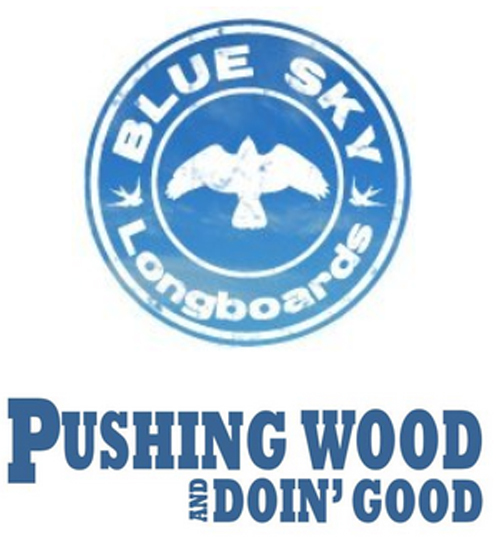 Blue Sky Longboards is calling for community support to help the company survive and expand its charity fundraising initiative, Pushing Wood and Doin’ Good, which has a goal of raising over $300,000 in the next five years for charity programs. The company was founded four years ago with a focus on leading the longboarding community in support of social ventures, raising thousands of dollars for action sports charities like Stoked Mentoring and The A.Skate Foundation. Now the founder, Matt Burke, needs to raise $35,000 by August 12th in order to buy back company inventory and majority ownership from a departing company investor, or Blue Sky Longboards will not be able to continue its valuable work. Supporters are encouraged to learn more and donate to the campaign on IndieGoGo. If you believe in companies that make a commitment to the community, please make a contribution to save Blue Sky on IndieGoGo or spread the word on Facebook, Twitter, email today! • We are an all-American company, building longboards locally with American hard maple, using American craftsmanship—not outsourcing manufacturing overseas. • Pushing Wood and Doin’ Good empowers teams of youth skaters to raise funds from donors who sponsor a ten-mile ride. We hope to hold more than 100 events in the next five years, engaging over 3,000 people and raising over $300,000. • In addition to the PW&DG initiative, Blue Sky organizes an annual fundraiser in NYC to support charities like Stoked Mentoring. • Our international team of 20 world-class riders are giving back to the community, including by teaching kids with autism to skateboard at A.Skate Foundation clinics. • Team rider Colleen Pelech was one of the first two women to skate across the country, raising awareness and thousands of dollars for Alzheimer’s research. • In 2012, we organized the Blue Sky Mile Challenge, a cutting-edge distance race using GPS technology, which paid an equal prize purse to both male and female competitors, encouraging others to end the gender inequality in sports.